Randomise Game- Draw, Act or Describe Your Way to Victory! Draw, Act or Describe Your Way to Victory! Every Saturday night once our baby brother Sam is in bed we have a ‘Game Night’. We get some nice treats in, Lottie and I get to stay up a bit late and we take turns to choose which board or card game we would like to play. We have recently got a new favourite to add to our Saturday night choices- we were sent a new game called Randomise to try out and it is easily the funniest game we have ever played. Lottie was a bit young for us to play the game properly with scoring and everything because she needed help reading the cards and working out what some of the words meant which made it difficult to be in teams but the game is recommended for age 8 upwards for this reason and we still had loads of fun acting out, describing and drawing for each other without actually crowning a winner at the end. 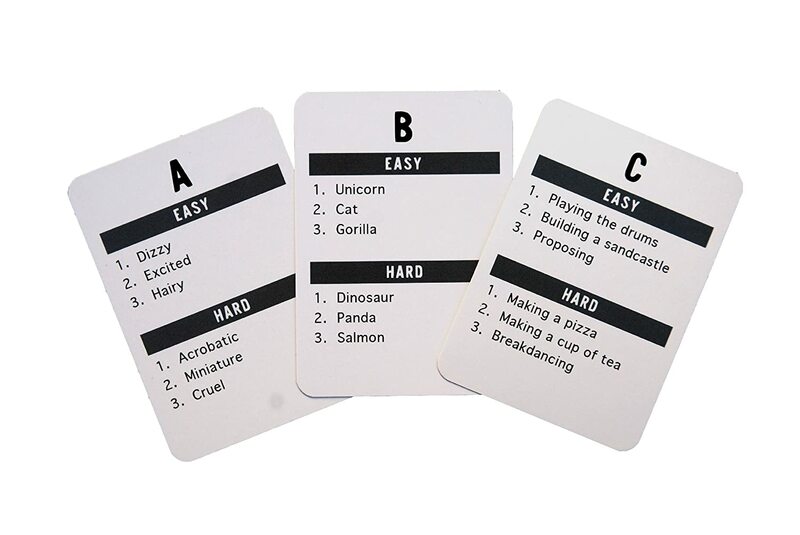 I loved playing Randomise with my family- we laughed so much and I think I will always remember my Dad acting out being a ‘Spotty Chicken Smashing Plates’ but I am looking forward to Easter though when I will be able to play and score using the rules with my friends. I think we all liked the acting option best but we also tried describing and drawing too and these are great choices if you don’t want to get up in front of everyone and be a bit silly. This is a great game for anyone age 8 and over (or age 4 and over with adult help) and is fun for everyone, my parents even suggested we should get it out when our family friends come for dinner over Easter so the grown-ups can join in. I am going to ask Mum to buy this game for my friend when it is his birthday next month. If you are looking for a family gift for Easter this year and want to give something that lasts longer than chocolate we would definitely recommend Randomise- the person you give it to will still be laughing next Easter! If you would like to know more about the game you can visit the website here and if you are looking to buy Randomise it can be purchased here.